[Read in Robert Stack’s voice] For every mystery there is someone, somewhere, who knows the truth. Perhaps . . . that someone is you! Have you ever seen a wine bottle like this before? If so, you’re already ahead of me. A few months ago, a friend of mine sent me this unusual wine bottle. She thought it was something an Armchair Sommelier would enjoy having in her collection. And I absolutely do, but I cannot figure out its provenance. This little bottle is a riddle wrapped in a mystery inside a cork tree. My friend received the bottle as a gift from her mother-in-law, who picked it up on a trip to South America (Peru maybe?). The bottle is covered in tree bark, with a swath of cork on its neck. My friend’s MIL told her the bottle was designed to keep wine at a consistent temperature. I’m intrigued. And confused. So I’m gonna put on my Nancy Drew girl-detective hat, and go straight to The Big Board (Google) to search for any combination of “bark bottle and cork”. Ebay has a couple of listings for “bark bottles” of one flavor or another. But neither seller gives any details about the history of the bottles . . . other than they’re covered in bark. Thanks, that part, I’ve got. 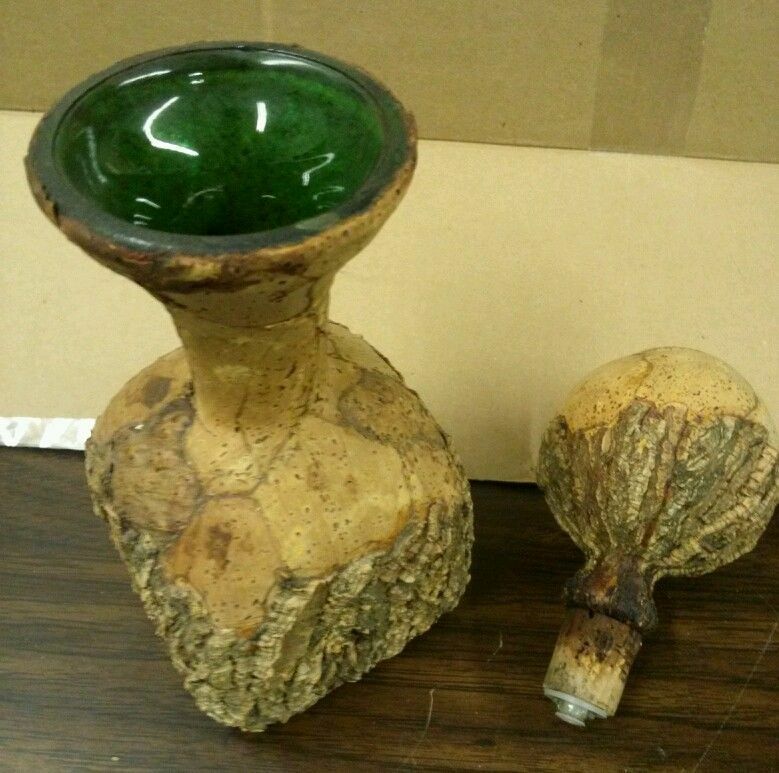 Tree bark decanter vintage Italy bar ware cork bottle – asking price: $10. 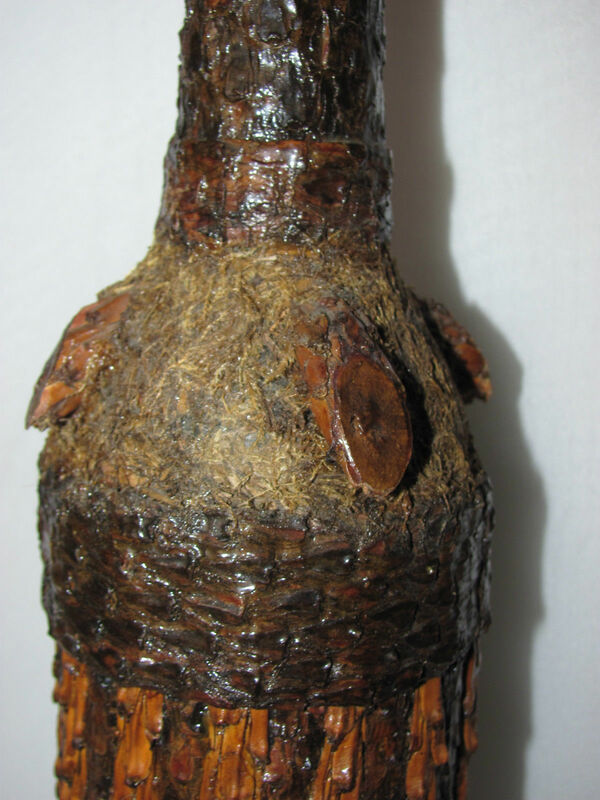 Vintage Handmade Bottle With Wooden Bark Bulgarian Folk Art – asking price: $65 (apparently Bulgarian bark bottles are more valuable). 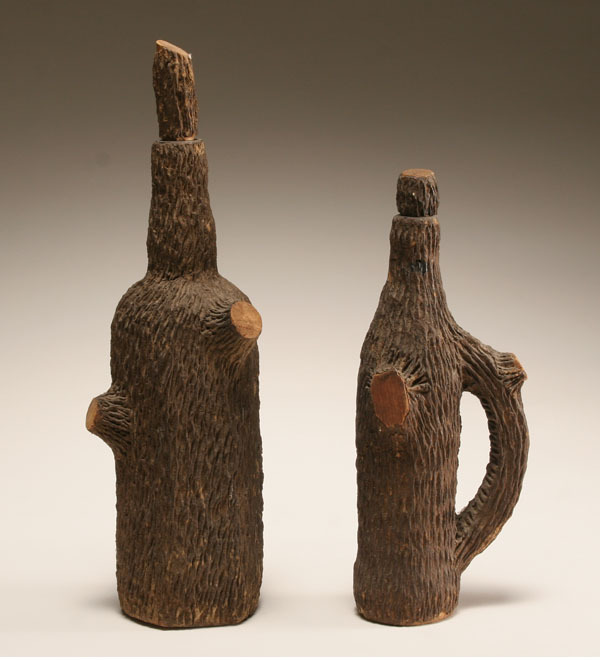 Riley Auctions listed a couple of bark covered bottles back in 2010 that sold for $130. Seriously? Earth dollars? My bottle is waaaay better looking than these guys. But again, no information on the history behind the bottles. The neck of my bottle is covered in what is very clearly cork. So, I’m gonna go out on a deductive limb and hypothesize the rest of the bottle is covered in cork tree bark. I just need a couple more pieces of evidence . . . Even further evidence . . . 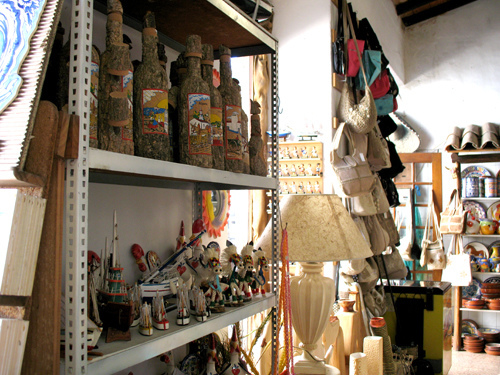 I found a photo of cork bottle souvenirs for sale at a shop in Portugal. The Portugal thing is throwing me. My girlfriend is pretty sure the bottle came from South America. 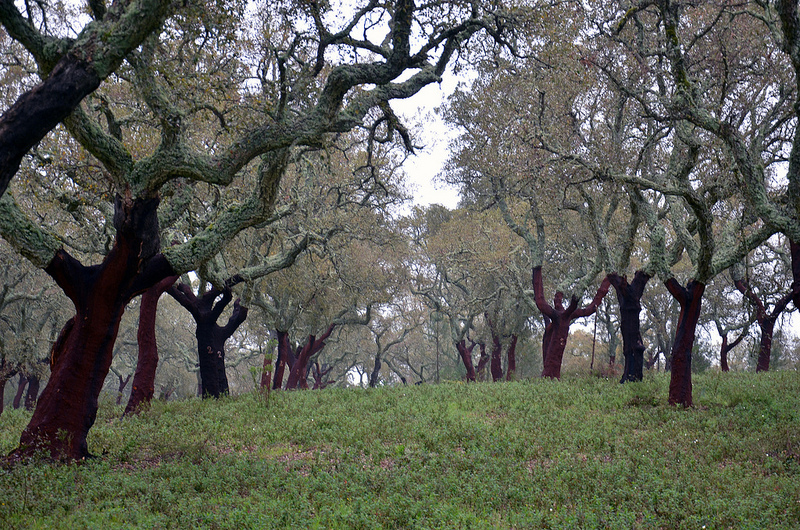 But cork oak trees are native to the countries surrounding the western Mediterranean, in particular, Portugal. Maybe, in some weird profit-making scheme, they sell cork products south of the equator, too? Intermission: Have you ever seen how cork is harvested? It’s absolutely fascinating . . . and strangely beautiful. Check out this post, Cork: Harvest for the Patient Farmer, for a great explanation of the process of cork harvesting, along with some spectacular photos. Photos like this one . . . haunting and peaceful at the same time. 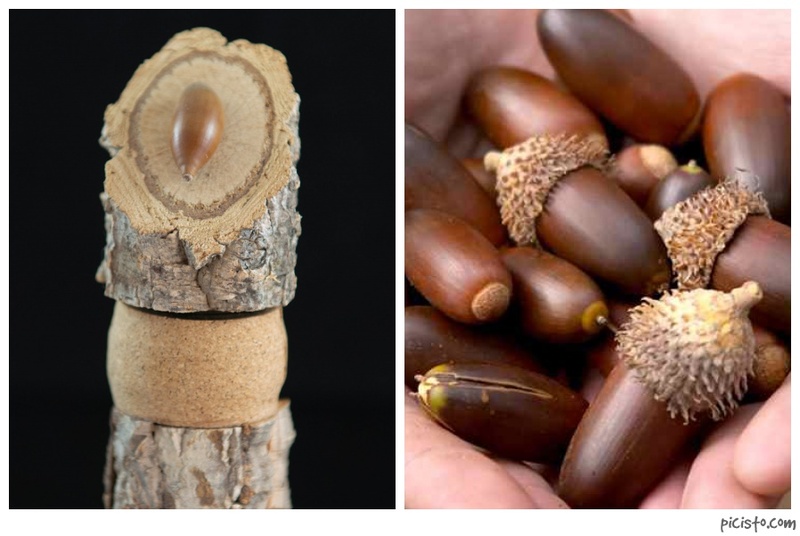 Wineanorak has a great post about how wine corks, specifically, are made . . . in case you haven’t had enough of corks. So where am I in my investigation? I’m willing to stake my reputation as an amateur Internet detective that this bottle is covered in the bark of a cork oak tree. But why? Maybe it’s exactly what my friend said — it keeps the wine at a consistent temperature. But so does a refrigerator. I suspect the purpose is a more basic one — marketing. Covering a wine bottle in cork oak bark uses leftover cork, and makes outstanding tchotchkes to sell to tourists. 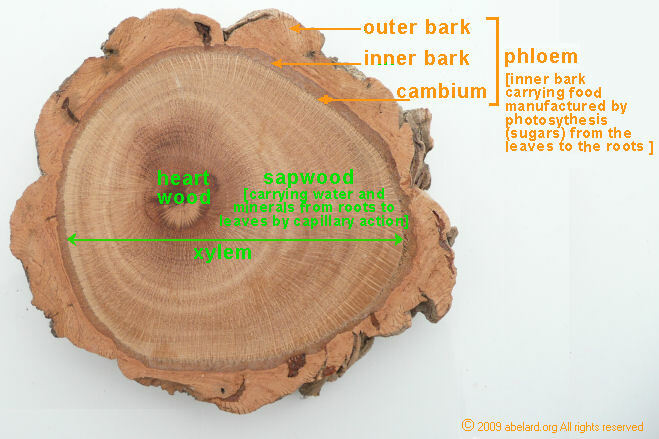 I went down a Google rabbit-hole to research this little bark bottle, but I learned some great stuff about cork along the way. So much stuff, I compiled a list of my Top 11 Thoughts & Observations about Cork (Top Ten lists are so 2013 . . . Top 11 lists are where it’s at now). Synthetic corks are tacky. If you’re going to use a cork to seal your wine, use a real one. I’ve made my peace with screw caps . . . but natural cork is still waaaaay cooler. Sorry, but it is. Cork oak trees are native to countries surrounding the western Mediterranean: Portugal, Spain, Italy, France, Morocco, Tunisia and Algeria. And just over half of the world’s production of cork comes from Portugal. Cork harvesting is completely sustainable — it’s biodegradable, renewable and recyclable. Bonus: you can use corks to make any number of both adorable and horrifying crafts. Each metric ton of cork can produce 66,700 wine stoppers (give or take a handful). Cork oak trees can live up to 250 years, but they have to be at least 25 years old before they can be harvested for the first time. A cork oak tree can be harvested between 13-18 times in its life. Dom Perignon was the first to use a cork stopper for his Champagne. A happy discovery, because he had been using wooden stoppers wrapped in rags, and they leaked. Go figure. The use of wine corks is at least partially responsible for the shift in wine bottle shapes from short and fat to tall and slender. Cells were first discovered in 1655 by British scientist, Robert Hooke, as he examined slices of cork under a microscope. There are 8 million cells in a single wine cork. True story — I counted them. The Mystery of the Bark Bottle remains an Unsolved Mystery. But I’m OK with that. The bottle is a great conversation piece, and it’s right at home on my wine-tchotchke shelf. One of my favorite things about wine is the collateral benefits that go along with it . . . and my bark bottle came with an education. 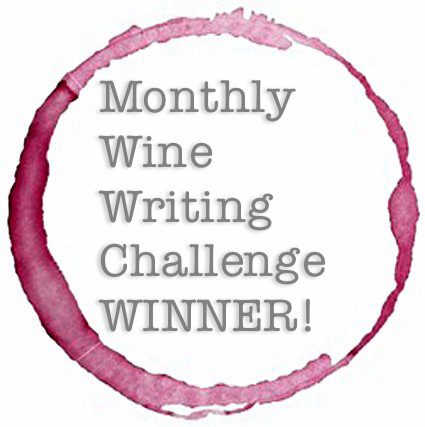 *This is my entry in the Monthly Wine Writing Challenge, #6. The theme this month is: Mystery! 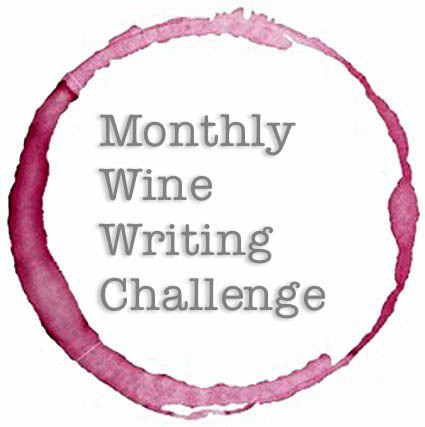 Next Post: Monthly Wine Writing Challenge #6 (Mystery)–Time to Vote! What an interesting post! Wow! I’ll admit to never seeing a bottle like this before. I appreciate learning a ton of new info about cork – it’ll be shared with friends at my next wine dinner – thank you! Thanks, Connie! So glad my bark bottle knowledge is having a trickle down effect . . . Salud!! Never saw anything like this. Looks very unique, but at the same time I’m sure there is marketing element in that bottle – one time I brought a bottle of rum from Mexico which was all covered in some plant material, so I have a feeling this is something along the same lines. By the way, is there a wine in that bottle? If there is, do you plan drinking it? Hi Anatoli! No . . . no wine in the bottle. And I can’t decide if that’s a good thing or bad. It would certainly be interesting if there were wine inside!! Salud! Very nice post as always. OMG . . . I had the EXACT same thought about the Ents, Stefano! But then I left it out because I wasn’t sure if anyone would get my nerdy LOTR reference. I should have known better! And no ring inside . . . dang it!! 😉 Salud! Wow, now thats one weird bottle. Yes, wondered whats inside or is it an empty bottle. It would be a conversation piece thats for sure. Agree with Stefano looks like something from Middle Earth. Empty bottle . . . 😢. Love that you got the LOTR reference, too!! Salud, Suzanne! So THAT’S where you found the disturbing cork pants? Nice! Hahaha! 😃😃 How exactly does one SIT in Sauron’s pants, anyway?? Salud! Really fantastic piece and a great entry for the challenge! Those trees look so eery! It is hard to believe that it causes no harm, but I am glad it doesn’t! Thanks, Jeff! I find it hard to believe that ripping bark off a tree doesn’t hurt it, too . . . Mother Nature is pretty awesome, huh? I need to put “visit cork tree farm in Portugal” on my bucket list. Salud!! 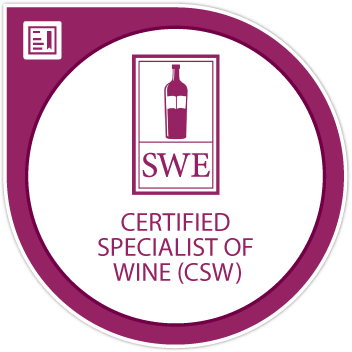 What does WineSearcher say? 🙂 Love the cork info…a geek’s delight. Cheers! Thanks . . . and don’t think I didn’t look . . . 😉! Salud! Thanks . . . it’s a conversation piece, for sure! Can you imagine? I have visions of some sort of draught conjured up in Potions class at Hogwarts . . . Salud, amiga! Open it – go on open it – a great follow up post! I just picked up this same bottle – with the acorn top – at an estate sale yesterday. It has taped on it “Aguardente De Medronho” which is from Portugal. It is an absolutely fascinating bottle and I love it! What a GREAT find!! I know you’ll enjoy your bottle as much as I enjoy mine . . . Salud!! In the early 80’s my grandparents brought back a bottle of liquore from I believe Pescara, Abruzzo, Italy. It was covered in bark and what was to appear to be knots or cut branches of a tree with a see through window showing a seaside scene. It contained a local liquore. I’ve never been able to find the bottle or the liquore since. It’s stumped me for years. How fascinating, Al . . . Did you keep the bottle?